I’ve been collecting movie books for decades. Those huge, impressive tomes with lavish photos and behind-the-scenes shots of artists creating celluloid magic are occasionally more entertaining than the films themselves. Yes, I’m referring to you Prometheus. Nice making of book, shame about the movie. Thankfully when it came to another Ridley Scott production, the maestro hit the nail squarely on the head with Blade Runner 2049, and the huge book that accompanies it is almost as impressive. Like the film itself, The Art and Soul of Blade Runner 2049 is an epic production, and while I’ve no doubt there’s a digital version out there somewhere, it will never match the feeling of heft and awe that such a physical book creates. It’s a few weeks since I saw the movie (twice), and I still can’t believe that Denis Villeneuve’s film achieved the impossible. It managed to match the scope and tone of the original, and I thought at the time Roger Deakins’ cinematography begged for a lavish book, just for those stunning images. It even featured a return to form for Harrison Ford, who gave one of his best turns in years. What really affected me is how much the movie got under my skin with its references to Nabokov’s Pale Fire, thoughts on being more human than human, and an ending about as perfect as any sequel to a 35-year-old classic can be. And it’s the ‘soul’ element that’s wisely mentioned in Tanya Lapointe’s book. Capturing the spirit of the original was the crucial element to making the film work. Throw enough cash at a movie and you can achieve similar epic vistas, but the beating heart of it? That’s a far trickier illusion to pull off. One section sums up how Scott’s original (unfilmed) vision for the first movie, involving a pan boiling on a stove, is finally created for the sequel. It’s nuggets of trivia like that which make the book come alive, while any tome which pays tribute to the geniuses at Weta’s effects company is all right by me. Their attention to detail is astonishing, especially when making the huge buildings which are as much stars of the movie as Ryan Gosling or Harrison Ford. 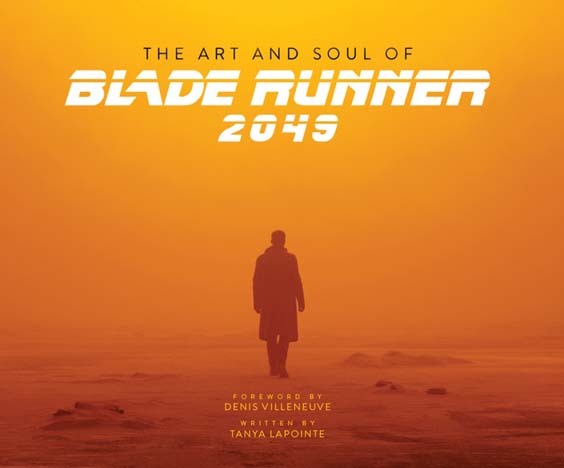 TAASOBR2049, as it might have been called by publishers during the book’s production, is the sort of abbreviated code which would be slipped into a film like ‘Blade Runner 2’, and the filmmakers would expect the audience to pick up the pieces. I’m guessing the film is littered with hidden clues for amateur movie detectives like me. That’s one of the elements which made the original such a delight. Adding a quote from William Blake, which I didn’t discover for years, was one of many rewards. Of course in these days when everything can be tracked down with a few clicks of a mouse, there’s a good bet every Easter egg will have been logged and uploaded for fans. I prefer to soak up my trivia via books like TAASOBR2049, especially as author (and Villeneuve’s life partner) Lapointe has worked so closely with the director. Blade Runner 2049 is a stunning cinematic experience that was worth the wait. I’m thrilled it has a book which is as stylish and epic as the film itself, and is as beautifully written. Until the movie is released for home viewing (hopefully with a documentary on a par with Dangerous Days: The Making of Blade Runner), this is a fascinating glimpse at a film every bit as compelling as the original. Blade Runner 2049 is not only one of the best sequels ever made, it’s also spawned one of the best art/making of books ever produced. And coming from someone whose been collecting them since the first film was released, there’s no higher praise.